What is the true purpose of the anti-Tajik protests in Uzbekistan? 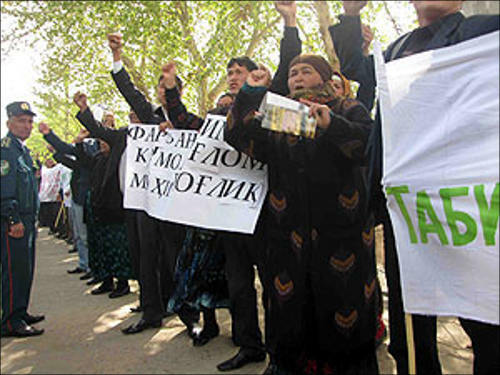 The environmental movement of Uzbekistan continues its campaign against the Tajik aluminum plant (in 2007 it was renamed into SUE Tajik aluminum plant (TALCO). On March 31 the students of the Termez state university met the deputies of Oliy Mazhlis (parliament), the representatives of the Environmental movement and districts of the Surkhandaria Oblast. The group of nearly 1000 people decided to urge the international organizations, UN General Assembly, UNEP, UNICEF, UNESCO and WHO immediately take measures to stop environmental pollution, produced by Tajik aluminum plant. The Environmental movement launched the campaign, mainly attended by the university students, on March 25 in the southern region of Uzbekistan. According to the activists the real tragedy "for many families is the growth of innate diseases among kids, damage to flora and fauna, lower productivity of soil in the Surkhandaria Oblast". 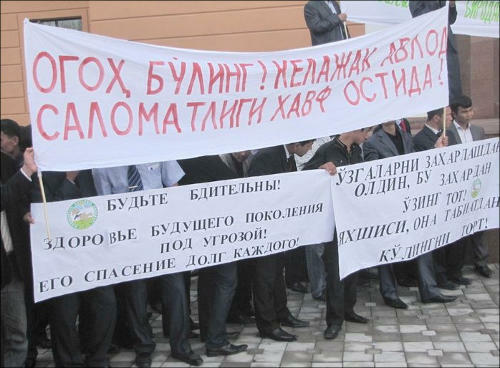 Despite the fact that the Tajik aluminum plant has been operating for 35 years only now Uzbekistan is protesting against the plant, through local residents and meetings, not really common for the republic. The point is in the cases when the protesters raise domestic issues the Uzbek authorities immediately suppress any opposition. 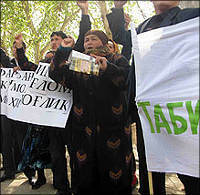 Sharing the environmental concerns of Uzbekistani activists, the Ferghana.Ru experts also said this was not the only reason of anti-TALCO campaign; rather, this is the convenient and "civilized" form of Tashkent’s official protest against the plans of Tajik government to build the strategic plants and the Rogun hydropower plant specifically. The list of claims, presented by the meeting participants in Uzbekistan, complies with general policy of opposition with Tajikistan. According to Ajdar Kurtov, the Chief Editor of "The Problems of National Strategy" magazine, issued by Russian Institute for Strategic Research, TALCO is the biggest enterprise in the republic that provides significant transfers to the state budget; the suspension of plant’s operations will cause serious economic damage to Tajikistan. The expert believes that the erection of Rogun will help Tajikistan increase the production of aluminum that will result in more intense environmental pollution. On the other hand, the major reason of Tashkent’s discontent with the Rogun is that Tajik government will be able to regulate the downstream water and, therefore, affect agricultural industry of Uzbekistan. In the opinion of Arkadiy Dubnov, the international observer of Vremya Novostei newspaper, the point of Uzbek message to Tajikistan implies the following: "You want to control us, but we will control you". "Uzbekistan shows it can influence one of the main income sources of Tajikistan as well as Tajikistan is trying to put control over water and energy system of Uzbekistan", Arkadiy Dubnov notes. The expert highlights that anti-TALCO meetings are initiated and controlled by Uzbek authorities since uncontrolled mass demonstrations in Uzbekistan are very rare event. In the opinion of Sanobar Shermatova, the expert of RIA Novosti and Ferghana.Ru, claims of Uzbek government against TALCO are reasonable in general, but Uzbekistan should better have conducted the official environmental examination as it is performed by environmental organizations in other countries. Showing certain data and proved facts, Uzbekistan could force Tajik government to improve plant’s operations. Today, Uzbekistan is collecting more arguments against the Tajik government, the expert said. It has to be mentioned that Tajikistan also has claims against few enterprises in Uzbekistan, located in the border areas. According to Oasis web magazine, the officials of Tajik State committee for environmental protection brought up the example of Bekabad mining plant that "caused big environmental damage to entire Sogd Oblast". Commenting on international conference, dedicated to environmental security issues in the Ferghana valley, in 2005 Pravda Vostoka, the governmental newspaper of Uzbekistan, said that "Uzbekistan is concerned with two mining plants and industrial zone of Ferghana. Today, there is over 1.5 million tons of waste, occupying over 1000 hectares of land". The same article indicates other environmental problems, also related to subsoil and waste water. Tashpmi.uz names major sources of environmental pollution in Uzbekistan, including the Bukhara oil processing plant, Navoi ore mining tailings dam, agricultural aerodromes, the Ferghana chemical plant, Kokand superphosphate plant and the Aral Sea. We can only hope that the initiative of the Environmental Movement of Uzbekistan will also attract public attention to these problems.